When I was a child, a library was my escape into another world. It was literally an escape actually – a world with no bullies. There existed a fascinating contradiction between the strict order of the books and the imposition of quiet time. The worlds of mystery, intrigue, passion and fire concealed between the pages I read. The library was a place for being alone, with my thoughts or the friends that I found within the worn pages of the library books. In light of my solitude, I find it interesting to see the library’s evolution after the digital assault. In an age where the internet is apparently causing our increasing alienation from each other, the library has become more like a community centre than a book repository. If you want to find escape and solitude, it can be found for you at home, on the internet. Information has broken free from the binding of the printed word. At the library, there are courses now in crafts, computers, and parenting – addressing the needs of the community. You can borrow audios or you can do research on the internet. Information is still just waiting there, at the library – except now, the information is waiting in different disguises. The new scope of the library seems to ignore its antisocial past. The community has embraced the library in a jumble of creative kids doing craft, riotous kids playing xbox, while a book club of Grandmothers chatter quietly in their own corner. The sacred silence has been shattered – and it doesn’t appear missed. Ebooks and the internet have changed our expectations for libraries – yet the communal need to exchange and analyze information is still very strong. Book clubs are peppering the landscape – nearly every good book store and library has one, if not more. The significance of the physical books seems to have taken a backseat to the content within. Ebooks, audio, the stories and the information once stored on paper is all around and easily accessible. There seems to be an explosion of e-publication, as people now self-publish using software from iTunes or Amazon. Everyone has a voice, and the digital noise is deafening. So where does that leave the physical book? Created by the Romans, the book has served us well. It has taught us, transported us to other worlds and experiences, and, in the case of guide books, told us where to go when we got there. Now we are replacing those paper pages with screens, just as we replaced vellum with paper. Ebook readers have the ability to store a library’s worth of books on one device that takes up a fraction of the space of a single book. Is it the survival of the fittest? Perhaps, but I believe that there will always be a space for my good friend, the paperback. I had my first battery fail the other day – right at the climax, everything coming together – then nothing. It was like coitus interruptus at the worst possible moment. Waiting for the recharge was truly agonizing. The books on the shelves taunted me with their smug self-sufficiency. I am also finding it hard to read an ebook in a bathtub filled with bubbles. You can put it in a ziplock bag, but it’s really not the same as reading a physical book. There is the constant fear of the bag leaking, if it accidentally dropped. All those books would be lost. In another time, bookshelves were a revelation of the psyche of the person you were visiting. I had shelves groaning with texts of philosophy and classics hoping to appear more sophisticated. Donna has always been an avid reader. 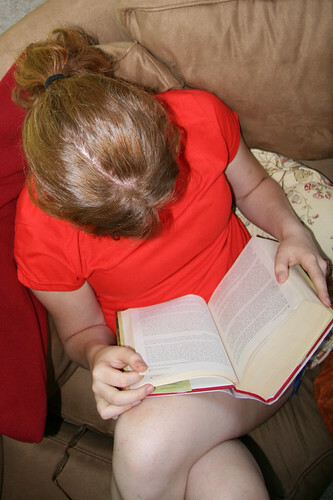 When writing this piece she reminisced of how she use to read and how she does today.